Tide just announced a new alternative to the classic bottle of laundry detergent. It basically looks and works just like a box of wine, which is sort of funny because of that whole meme about teens eating Tide Pods. But the new Tide Eco-Box is no joke. It’s actually a glimpse into a future where Amazon is dictating what our stuff looks like. The new box of Tide is specifically designed to play nice with e-commerce. Sure, it’s good for the environment, too. But this streamlined, easy-to-ship box makes it easier for Amazon and friends to sell detergent out of their giant warehouses. One Proctor and Gamble brand manager Isaac Hellemn said in a press release, “The Tide Eco-Box is designed to keep the convenience of online shopping for the consumer but reduce the overall impact of that convenience on our environment.” The release goes on to detail how the Tide box can be shipped without a secondary box or bubblewrap, is lighter than plastic bottles, contains less water than regular Tide, and takes up less space on delivery trucks. Few would argue that environmentally conscious packaging is not a great thing. Furthermore, there’s no doubt that shipping more goods means that we ought to make it easier on the workers who are taking care of that last mile. 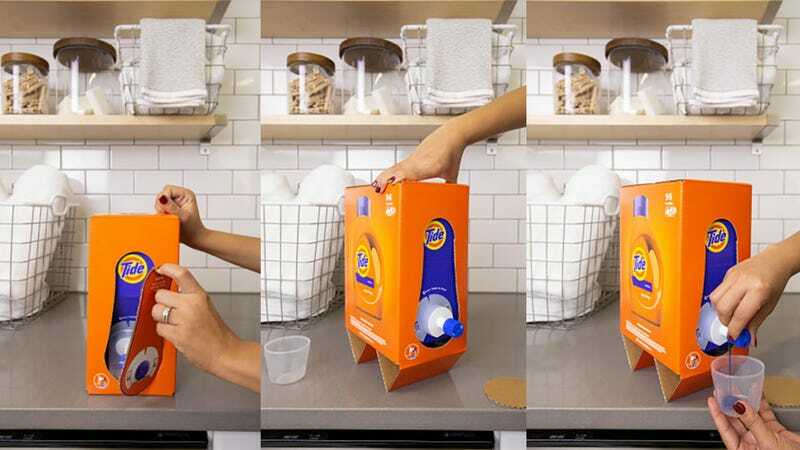 But when you step back and look at products like the Tide Eco-Box, you also have to wonder if companies like P&G are designing these things for the environment and the consumer and not just the Amazon overlords who stand to profit by streamlining logistics. That box of laundry detergent might weigh less and contain less plastic than a bottle, but that’s not exactly making the consumer’s life better. It is making it easier and cheaper for Amazon to ship. Think about it this way: Laundry is a messy job. We all know how gross and slimy a bottle of Tide can get from everyday use. Imagine what one little spill would do to those cardboard legs. And think about how slippery that twisting nozzle gets after you’ve poured a dozen loads-worth of detergent out of it. And when the liquid level gets low, you’re probably going to have to bust that box wide open and pull out the weird pouch inside so that you can get to the last few drops of detergent. Pouring detergent out of a bottle is actually pretty handy, when you think about it. So even though it’s not specifically mentioned, Amazon is becoming synonymous with e-commerce and efforts like this to make products more e-commerce friendly. Part of the challenge for companies that see sales shifting from store shelves to Amazon warehouses is the fact that selling certain goods comes with a lot of special Amazon-specific packaging requirements. There’s a YouTube video from Fulfillment by Amazon, for instance, that explains the specific process for shipping liquids. Amazon also maintains a dynamic list of “products regulated as dangerous goods,” and if sellers don’t do the right paperwork or package things correctly, their listings can be taken down. Laundry detergent and dish soap are currently on this list of dangerous goods. Amazon’s ambitions to control packaging and, as a result, even more of its supply chain doesn’t stop at soap. The company has embarked on a newly aggressive effort to work directly with producers and sellers to create packaging that better adapts to its logistics needs. Earlier this year, Hasbro partnered with Amazon to redesign its toy packaging to eliminate extra space in the boxes and cut down on waste, as part of a decade-old Amazon program called Frustration-Free Packaging. Amazon did a whole video and blog post celebrating the partnership. Remember those windows that let kids see the doll inside the box? Those are going away, but Hasbro Toys are getting some extra promotion on Amazon dot com. Frighting as it might be to admit, this is just more evidence that Amazon is getting so big that it’s not just changing how the world ships goods. It’s changing how we package them, too. And frankly, the United States Postal Service could be doing the same thing, if it weren’t too busy struggling to ship so many Amazon packages. In other words, package design does change because of rules and regulations that aren’t dictated by Amazon. A company called Garçon Wines, for example, recently created a flat wine bottle so its packages could fit through standard-sized mail slots in the United Kingdom. They’re kind of funny-looking, but they also make it easier to order wine. So, we’re just a few weeks from 2019, and it looks like our future is full of soap-filled pouches, smaller boxes for dolls, and flat bottles of wine. It’s a little weird, though some of this new stuff will make some peoples’ lives easier. All of these e-commerce friendly innovations are bound to improve Amazon’s bottom line, though. Not that the company needs any help. Amazon will inevitably be the e-commerce powerhouse for years to come, so we should expect more companies to design more things specifically for the online store. Just last week, we saw Apple and Amazon strike a deal that led to Apple selling its products on the site for the first time as long as Amazon agreed not to let non-authorized third party resellers sell stuff. We’ve seen TVs equipped with Fire TV software and designed to be sold only on Amazon. And we’ve seen companies that couldn’t keep up with the Amazon approach to e-commerce go bankrupt. This is only the beginning. Just wait until Alexa becomes sentient and starts deciding how you’ll dress, what you’ll eat, and who you love. It’s not the craziest idea any more.